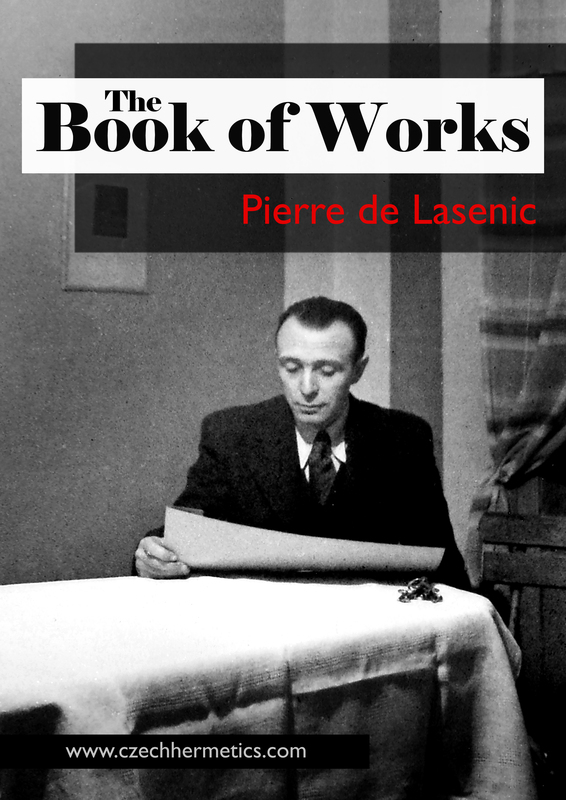 Tonight Is The First Day of The Year-Long Practice of Posism from Pierre de Lasenic’s, The Book of Works. All that is needed for this practice, as a prerequisite, is to have at least done introspection previously. The purpose or goal of this practice is not to become master at accumulating the elements or being able to correctly carry out auto-suggestion, but in this case, it is a year-long process which aligns one with nature as they move through the seasons and through each zodiac sign. The posisms are not the same as directly accumulating the elements as with Bardon’s method, as one starts internally, projects the elements outwardly and then brings the element back inward again (1. esoteric/inductive method, 2. project/emit element, 3. exoteric/deductive method, 4. expel negative energy/retain positive energy). After the sun has set or during night, one carries out the posism of the air element, followed by the practice of the earth element. One might ask how the practice of the earth element is carried out as, in this case, the earth element is not practiced as a posism, itself, but more as a meditative process in which one carries out the instructions as seen in The Book of Works and without any specific movements being ascribed to it. As Lasenic says in The Book of Works: This exercise should essentially be initiated on the autumnal equinox; the reason being, because before the beginning of a new life or inner being takes place, we must first go through a temporary death, which is analogous to Nature. If you have not previously gone through The Book of Works as outlined, it is ok. You might take some time before you carry out the posisms at night, to go over the process of performing the posism of air and the practice of the earth element. So with air: You simply perform the posism of air as outlined in The Book of Works or as seen on our YouTube video of the posisms. And with earth: Immediately following the posism of the air element, one imagines the earth element collecting into a sphere within their solar plexus during the inbreath and then imagines the condensed earth element expanding out into infinity with the outbreath (breathing should be normal and relaxed). The practice of the posism for the air element is only performed once, while the practice of the earth element is also performed once as well, but again, by imagining a sphere of earth in the solar plexus during the inbreath, followed by a sphere of earth which expands and fills out the entire universe during the outbreath. 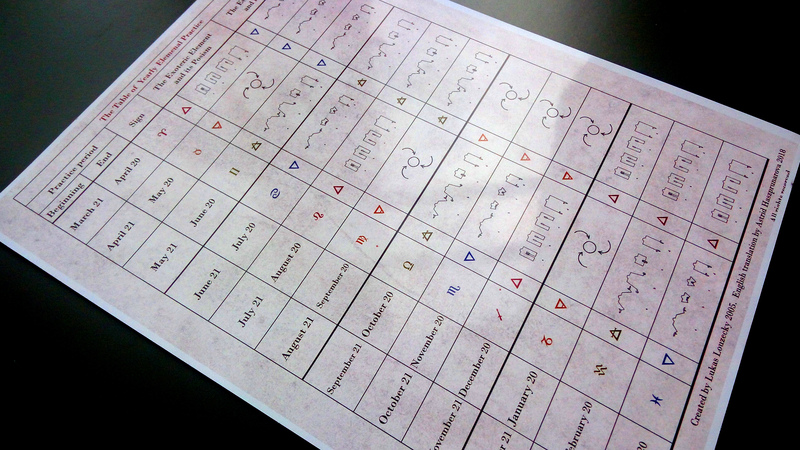 Q: Hi there, I had a closer look on the elemental posism method by Lasenic and that had raised some questions. I hope them to be clarified by the group. I tried to compare the time spans for the four elemental posisms, as they are declared in the book of works, with the time spans which are mentioned on the cheat sheet (which is actually a great help guys). However I came across a difficulty there, namely if you look at the timespan given for the air posism e.g. : Book of work says 35 days in summarum, although the cheat sheet mentions the time span from 21.09. until 20.10. for air and earth. Which time span information is now the correct one? The one from the Book of works or the cheat sheet? Or is any combination of posisms as mentioned in the sheet just to be exercised for about a month, intuitively plus or minus some days? A: The dates are according to the zodiac when the sun is entering a zodiac sign, so the dates stated are only estimates which change every year and that this elemental exercise is really about becoming in tune with and feeling the rhythm of nature, and after practicing this for sometime, the person should be able to feel when the sun is entering a new zodiac sign. Q: And for the second, I saw the several steps which any elemental posism as described with Lasenics is consisting of. Now you have steps like, 1. holding the pose until a feeling perception is achieved, or 2. letting it permeate, 3. concentrate it on fixed point etc. My question here now is: If you work according to the cheat sheet (so that you do 2 posisms any evening, 2 elements) does that mean now that you do e.g. the working steps 1-4 for the air posism and then, after that, the working steps 1-4 for the earth posism? Just to put that clear for me. A: You can start after introspection, but as you’re doing the posism, you are going through steps 1-4, but understand that the goal of the exercise is not a perfected auto-suggestion, and this is one way of how the posisms of Lasenic differ from the elemental exercises of Bardon. This exercise is for “Tuning” your microcosm with the macrocosm and achieving elemental balance. You can start with the posisms today, on the Autumnal Equinox, even without previously training the elements as outlined in The Book of Works. The posisms themselves, are already charged and quite powerful on their own after over 80 years of use within the Czech circle of Hermeticism in which they have been faithfully practiced. The only element that one is performing what is described in The Book of of Works, is the earth element, as there is no posism that is performed with this element during the year-long practice. The practice itself which was described earlier, is also described in § 18B of The Book of Works. Q: For the third: When doing the posisms while autosuggesting the elemental quality, do you pull it into the palms by pore breathing or do you do it without consciously in-pulling? A: No, pulling it through the lungs and normal breathing is fine. Pore breathing is possible, however, it is only recommended for someone who is experienced and someone who is confident enough in their ability to perform pore breathing in which they are capable of pulling the elements through thousands and thousands of pores at one time. Additional Question: Lukáš, what do you think a person should develop more of? Things that a person has more of a natural talent in, such as visualization, or should he or she develop things that they are having a more difficult time with? A: It’s always about balance. So we recommend focusing more on the things that the person is less developed in, in order to promote balance. As a rule, we recommend 1 part of training with things that you are good at and 9 parts of training which are focused on the things that one is struggling with. However, we do recommend to also keep practicing the abilities that one has a natural talent for, in order to avoid demoralization and to help keep one motivated on their journey. Lukáš gives all of these answers, with the emphasis that they are only suggestions and that they should only be taken as such and also that if one was to miss the autumn equinox as their starting point of this practice by even a few days, that it is of no consequence, as it is better to start the practice a little late than to never do the practice at all.